One reason I love my friends: they're foodies too. One hot sunday afternoon, we all decided to carpool down to Lockhart and conduct a thorougly scientific comparison of the Lockhardt BBQ joints. 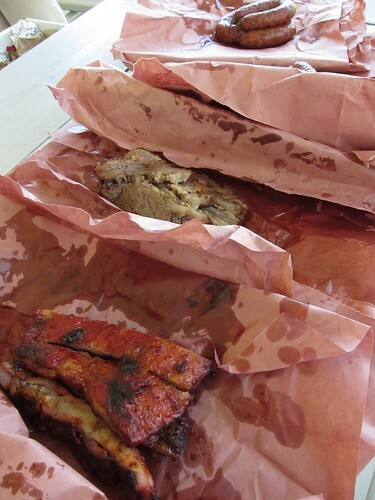 Upon reaching Lockhart, we were disappointed to learn that Kruetz's Market is closed on Sundays so we had to do a comparison of the 3 remaining BBQ joints, Black's and Smitty's. 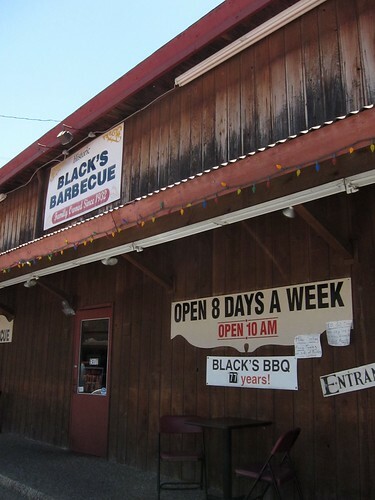 At precisely the same time, a carload of us went to Black's and a carload of us went to Smitty's so the BBQ would be fresh and purchased at the same time. We decided, at a minumum, to get brisket, ribs, sausage, potato salad and cold slaw. We could also make an executive decision to get other additions we thought looked tasty. 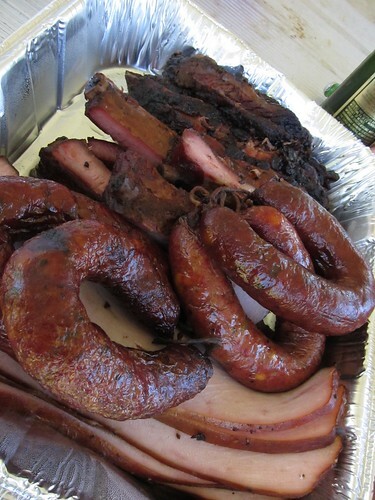 Then, we'd all meet up at the city park for a delicious picnic of BBQ. I was in the carload that went to Black's. When we arrived, I was stuck by how old fashioned the whole town looked. There was a beautiful old courthouse and town square. But unlike Fredricksburg, there weren't kitschy country stores in the town square. It had a slightly depressed old Texas feel. Clearly, the only thing people come to Lockhard for is the BBQ. Black's looks much like the rest of Lockhart. Old, a little run down, and 100% Texas country. The exterior looks more like a deer feed/hardware store than a BBQ restaurant. 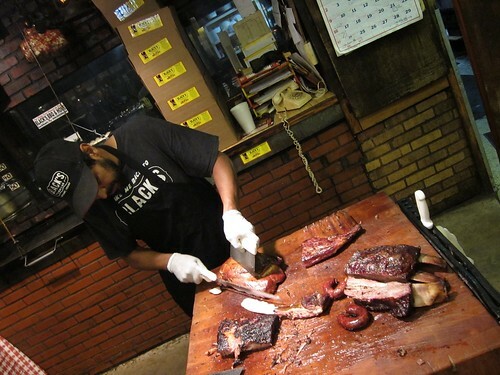 But once you step into Black's, it's an oasis of Texas BBQ. 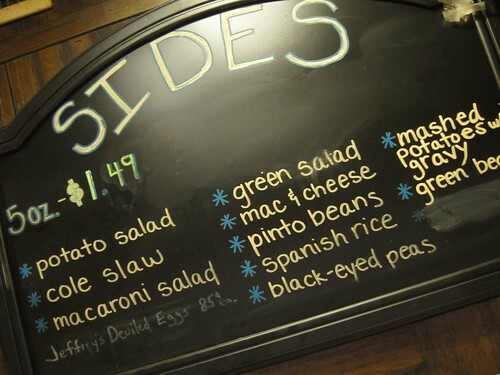 The first thing you'll notice are the impressive selection of home cooked sides. Many more sides than I've seen at any other Texas BBQ joint. The meat is kept in an ingenious meat locker and is cut fresh when you order it. Once we had procured our meat and sides, we went to the municipal park to conduct our thoroughly scientific taste test. In this picture, the Black's offerings are in the front and the Smitty's offerings are in the back. Smitty's was meatier, almost gamey, while Blacks was creamier, with a finer blend. We were all split down the middle, some liking one more than the other. While I usually like a finer blend sausage, this time around I, liked the intense meaty flavor of the Smitty's sausage better. Black's outstanding brisket was the winner of the whole meal. It was moist, soft and tender, fell apart. Smitty's was dry and lack-luster. The Smitty's ribs were moister but were covered in a sickly sweet red sauce. The ribs at Blacks had a better smoky flavor, but were dry. In the end, most people preferred smoky over sweet. But neither offering was all that great. I liked the Blacks better, though, but I got overruled by the masses. Black's potato salad is chunkier with large pieces of potato. Smitty's potato salad is creamier, but in my opinion is, too mayonnaise-y. I got my fill of mayonnaise potato salad living in the Midwest. I want some mustard in mine now. Oh well. Smitty's slaw used 3 different types of cabbage, carrots, and had a pleasant a peppery aftertaste. It was much more complex (well, as complex as cold slaw can be) than Blacks which only had 1 type of cabbage but was tangy. While none of the other sides at Black's were all that spectacular, it won out in sheer volume of available sides. 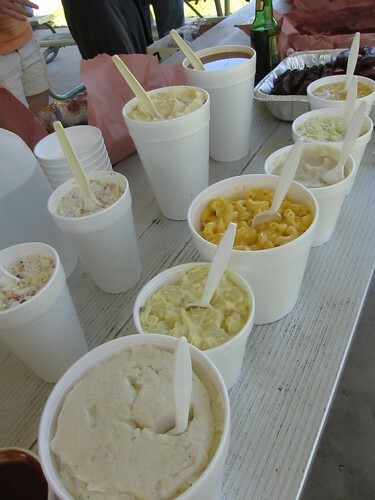 Smitty's offered potato salad and cold slaw, that's it. However, Black's had yams - sweet and gelatinous and all together pretty bad. And creamed corn - much better than the yams, nice and creamy with a hint of tarragon. They also had mashed potatoes - peppery and good with the cream gravy. And macaroni and cheese - basic and not that great. 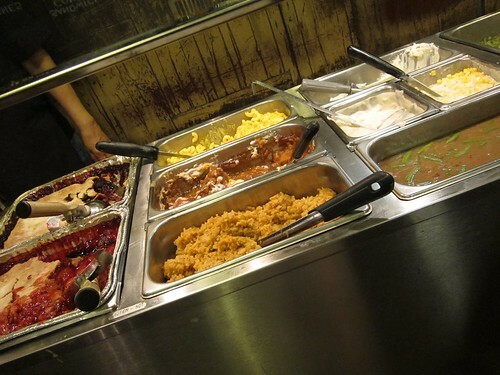 The better selection of sides and the clear win in the brisket department let Black's nose ahead of Smitty's. However, I must state for the record that neither was the best BBQ I've ever had. Except for Black's brisket. It was quite good, and may possibly be the best brisket I've had in Texas (yet). Mariah is a Systems Engineer for a company with a silly name. When she's not killing herself in school, she's dancing, dating, traveling, eating, blogging about eating, and going to Alamo Draft House.